I am drawn to detail and pattern, particularly the kind of detail one may not notice at first glance. I enjoy exploring exotic lands to discover the hidden beauty found in nature, be it around the world or in my own back yard. As an explorer and an artist one needs to train the eye, not just to look, but also to see and observe. The pattern of the leaves, lines in a tree’s bark, clouds in the sky form similar “andamento”, visual movement or rhythm produced by the mosaic elements. Look at the color variation of distant hills or the majestic beauty of a massive oak; these things surround us, we just need to see. Mosaic is a language, tessera are the letters to form the lines/words and sentences. My mosaics are a study of these rhythms. By leading the viewer through the contours, ebb and flow of the subject. 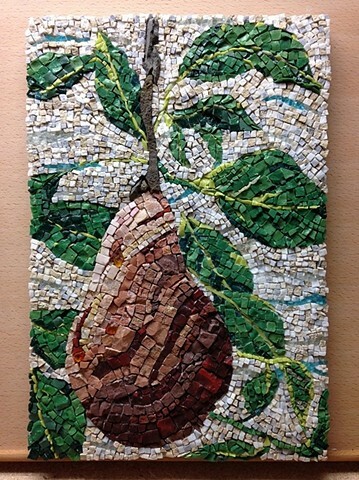 A mosaic artist creates the feeling of a subject with the material’s size, shape, colors and elements. My work is a combination of modern materials and ancient practice still rendered with the same techniques; using glass, stone, nipper, hammer and chisel. I am dedicated to preserving the history and tradition of mosaic art, along with the techniques and materials used in the past. One must study and remember the past to be informed for the future.